Develop a strategy for Pirate’s Booty and brief a creative team and the Chief Strategy Officer at The Martin Agency. My team worked on Pirate's Booty, which is a puffed rice snack that targets parents and kids. Even though it uses bright colors and cartoons on its packaging, Pirate's Booty goes to market as a wholesome, family brand and falls into the better-for-you (BFY) snack category. 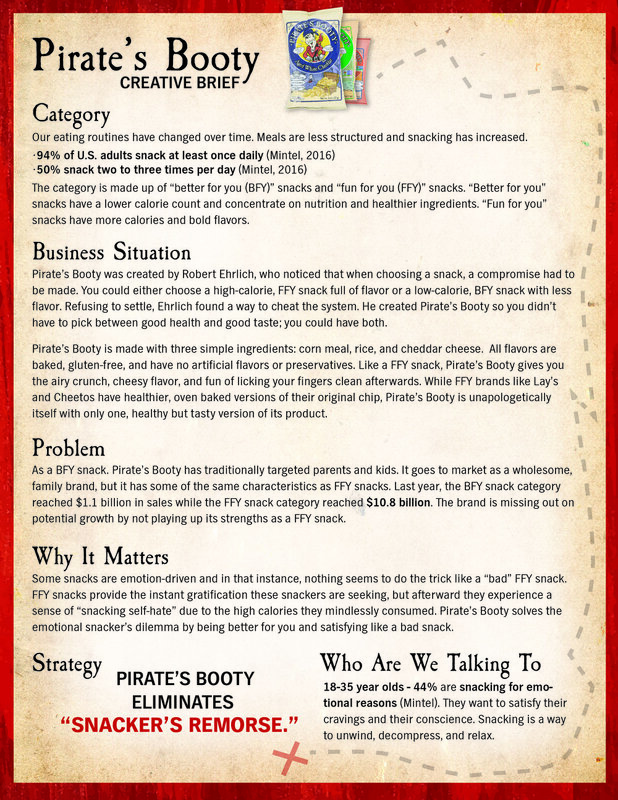 In order to increase sales, Pirate's Booty should reposition itself as a fun-for-you (FFY) snack rather than a better-for-you (BFY) snack, since the FFY snack category is nearly ten times larger at $10.8 billion. The brand is missing out on potential growth by not playing up its strengths as a FFY snack. According to Mintel, 44% of 18 to 35-year-olds snack for emotional reasons. When we're snacking just to snack, we want to eat something that's bad for us. But afterwards, we experience "snacking self-hate" due to the high calories we've mindlessly consumed. Pirate's Booty solves the emotional snacker's dilemma by being better for you, but satisfying like a bad snack. Pirate's Booty eliminates "Snacker's Remorse." Our treasure map themed Pirate's Booty brief we handed to The Martin Agency during the briefing. For this project, I learned to work with two other strategists and pull the most relevant pieces of information out of our research to form an insight and a strategic direction for the brand. In addition to the one-page brief, we used slides to tell a story and deliver the creative briefing in an engaging way. It was exciting to visit The Martin Agency office, present our strategy to the CSO and a creative team, and have a discussion with them afterwards and get feedback.